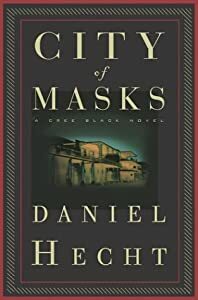 I the past two weeks I have listened to two thrillers by author Daniel Hecht. Hecht is a great writer – his writing has a poetic, lyrical quality. City of Masks features parapsychologist Cree Black, who travels to New Orleans in order to investigate a haunting in a (creepy!) Garden District mansion. In trying to find the source of the haunting, Cree must delve into the (creepy!) history of the family that owns the house. The author did his homework, because he gets the city’s geography right, and the narrator did a passable job on the accents. The story is capital C creepy – maybe more so because I was listening and so couldn’t skim ahead. The second book, Skull Sessions, takes place in a different ‘universe’ of characters. Paul, who has tourettes, takes a job restoring the lavish, isolated (creepy!) home of his estranged aunt. While working to repair the almost inhuman damage at the (creepy!) secluded lodge, he tries to unravel the mystery of who – or what – wrought the destruction. This inquiry that requires him to delve into his family’s (creepy!) past, and uncover some of his own forgotten (creepy!) memories. Again, super creepy, all the more because I couldn’t skim through the more suspenseful parts. (Particularly creepy when walking to the car after work, in the dark.) This one kept me guessing til the very end. Next up is the sequel to City of Masks, which I have in paperback. I’m curious to see whether it’s more or less scary this way – on the one hand, I’ll be able to skim, but on the other hand, a book that I read gets farther under my skin than one I listen to. This entry was posted in 2011 books, just liz by Southern Girl. Bookmark the permalink.